Do you long to see your yard explode with color and life? You can create the vibrant, imaginative, attractive aesthetic you want by simply adding an island flower bed. Island flower beds stand alone and do not connect to any other parts of an outdoor space. By using retaining wall bricks as the border, you can elevate a traditional island bed to an exciting, eye-catching level. Before you can begin constructing your raised flower bed, you need to choose a central location in your yard. Select an area that will be viewed from all angles. Once you choose a spot, mark the shape of your bed with string, flour or spray paint. There are endless designs to create, so don’t be afraid to be imaginative. Circular beds are crisp and subtly charming, while flowing, unforced shapes blend well with the natural environment. Lay newspaper down in the center of your outline. This will provide temporary protection against weed and grass growth while your flowers or greenery begin to take root. Do not use long-lasting barrier protection because it will prevent new roots from forming properly. Growing your plants on a raised surface will naturally improve drainage, so you do not need to worry too much about the airiness of the soil you build on. When designing a ground-level flower bed, you need to break up a good amount of the soil. However, a raised bed needs less attention in this area. You will only need to bust up the soil around the inside perimeter of the island. Dig a trench that is approximately ten to twelve inches wide around the inner border of your outline. Work with a flat-bladed shovel so you can use the bottom to level the remaining soil. As you dig up the soil, dump the pieces of dirt on the top of the newspaper. You will eventually need to fill the rest of this area with soil or compost, so have some bags on hand. If you use compost, choose a variety that improves the quality of the soil. Once you have the trench cleared away, lay your bags of compost or soil on top of the busted up sod in the center of the island. When paving bricks are used as plant bed borders, the soil can seep through the spaces in between each stone. To prevent this, place landscape fabric along the entire inside of the trench. Let the excess fabric drop toward the inner part of the island. The fabric will act as a wall between the bricks and the soil you fill the bed with. Lay your first row of bricks on top of the fabric one by one, and level each stone with soil when necessary. After you finish setting your first row of bricks, use landscape paver adhesive to fuse the second layer of stones to the first. You can alternate the pattern of the second row so each brick looks staggered on top of the previous row. Once you get to the last brick, you may need to cut it to fit properly. Add as many rows as you want to get the desired effect. When you’re done constructing the wall, cut open the bags of soil or compost and fill the bed. Packing down the edges will provide a more sturdy foundation for your plants. You will most likely need to trim the excess landscape fabric before you secure it to the soil. Don’t leave more than six inches of extra fabric. Once you cut the fabric, fold it toward the inside of the island. You can use landscape fabric pins to attach the material to the soil. Top the soil with a high-quality mulch in order to protect your plants and aid in moisture retention. Because the soil in your island bed will settle with time, it’s a good idea to overfill the area with the mulch. You may want to do your planting before you lay down the mulch. This makes it easier to properly place the plants, but it isn’t always necessary. If there is space between the grass and the front of the bricks, fill the gap with soil to prevent the bricks from shifting. By raising your island bed instead of building it low to the ground, you will create a focal point for your outdoor living space. 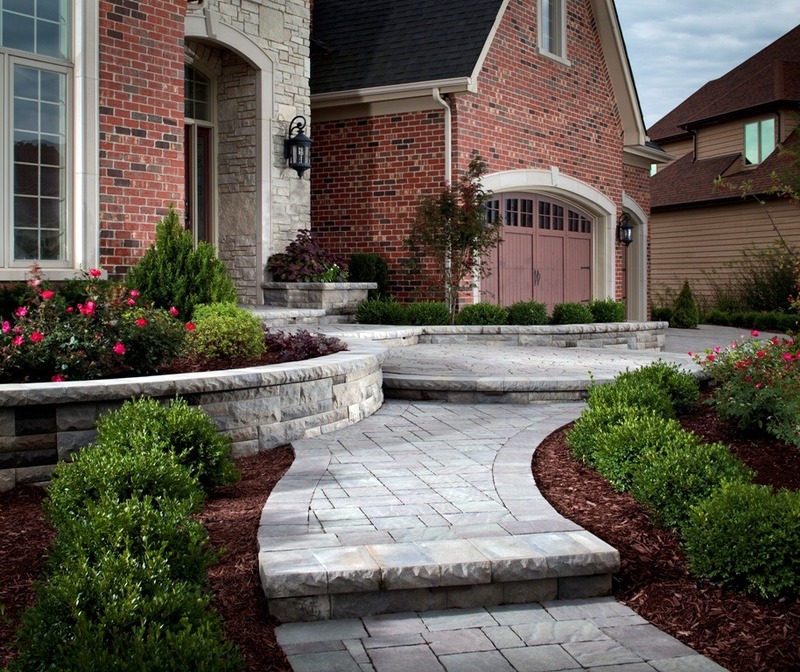 An island bed bordered by retaining wall bricks or pavers will add a richness to your entire backyard. It will fill your yard with the colors and textures you may be missing. Design your own unique island flower bed, and you will be giving your backyard an instant makeover.